Ubisoft’s newest mega-game sequel officially launched yesterday, though it’s actually been out since Tuesday for those who bought the $145 version. It’s another Division, which means it’s also another Destiny or Diablo or Anthem. It’s another one of these games meant to preoccupy its players with having digital fun while obtaining better and better loot. Like those games, it’s also going to be updated by its developers for weeks, months and years to come, meaning it’s going to be a game that gets reassessed regularly. We will be following it along the way, with a full review to come in about a week. Right now, right at launch, I’m taking it in as rapidly and voraciously as a working father of two can. I’m taking some time to play by day, some at night after the kids go to bed, and all the while having the best kind of struggle to keep forging ahead. The game is generous with interesting sights and sounds. As my colleague Paul recently pointed out, wandering through the game’s virtual DC is a pleasure, like touring a new city in real life. The world is massive. The first Division was set in a devastated New York City in winter. 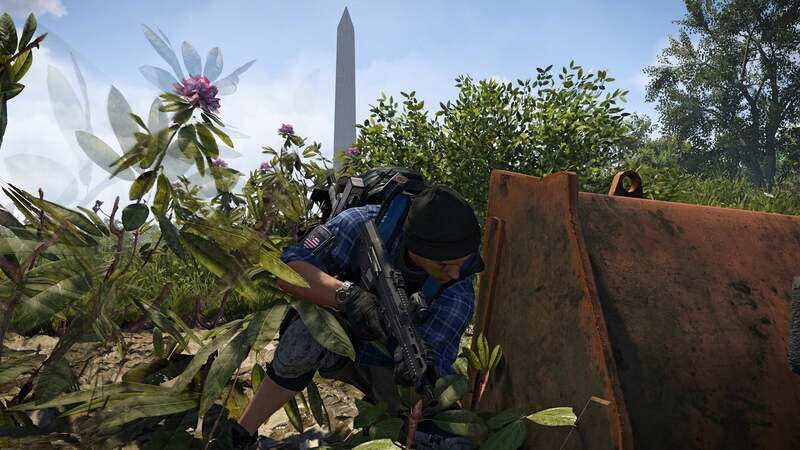 Division 2 moves the narrative forward to summer in a Washington, DC, that is showing the first buds of societal recovery. The city is the game’s world, the White House your headquarters. You can explore hundreds of city blocks full of museums and monuments, stores and subway tunnels, parks and alleys. The conceit is that the US is recovering from a biological weapons attack that has left DC overgrown with vegetation and under siege from marauding gangs and paramilitary squads. 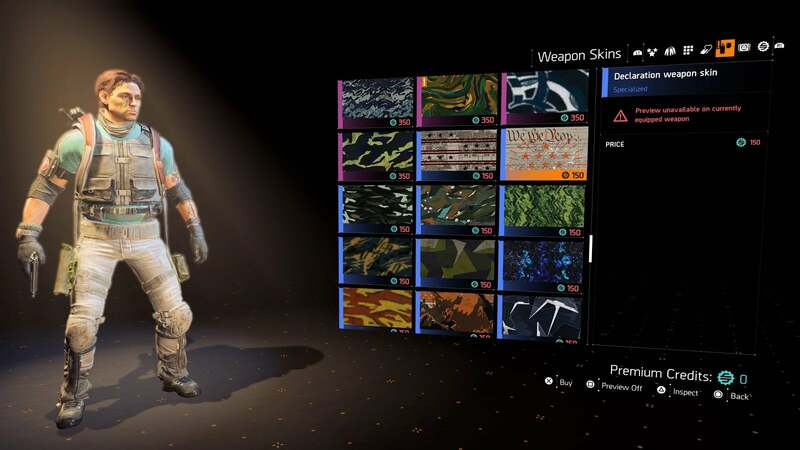 You’re a member of a government-authorised group of peacekeepers called the Division set to patrol the city, shooting your way through enemy factions and helping civilians who are building settlements and taking up arms to fight alongside you. Helping people is a much bigger deal than it was last time. Aside from the lack of snow, the starkest difference I’m feeling between the first Division and this new one is the presence of a civilian population that is actively involved in the recovery of the city. In the first Division, you might encounter some civilians shuffling down the street asking for bottled water. An allied military force, the JTF, would sometimes appear to provide largely useless combat support. 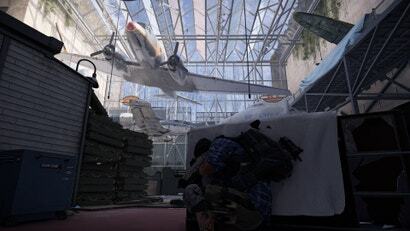 In the sequel, you can join civilians making coordinated resource runs or patrolling and effectively fighting enemies. Early in the game, players will reach the first of a few settlements: Large safe zones full of men, women and children trying to rebuild their lives. Players receive missions and checklist tasks called Projects that can be completed to upgrade the settlements with a relatable focus on quality of life: The creation of a water treatment facility or kids’ play area, for example. You can summon friendly fighters to help retake many of the game’s “control points”, establishing more and more of a friendly presence in the city. The recovery of DC feels like a real group effort, which gives the game a more optimistic vibe. The core gameplay is fun. At their most basic, The Division games are third-person cover-based shooters. The idea is to never be out in the open and to strategically move through a space to outmanoeuvre enemies. That all felt fine in the first game but was undermined by the game’s enemies. They took too many shots to kill and had uninteresting attack patterns, which made combat tedious. 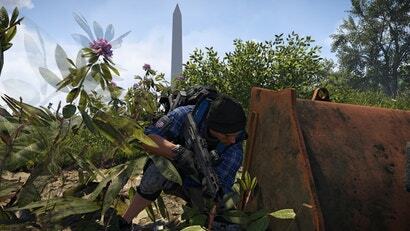 Division 2 enemies die more quickly but are also far smarter, regularly trying to flank or otherwise outmanoeuvre you. I’m much more worried about how enemies can counter me, and I have to be much more alert and efficient in my tactics. No more just hiding and shooting. I have to move more than ever and deploy my special combat gadgets more creatively. There are animals, but you can’t pet them. The surge of flora in DC is complemented with the appearance of animals. Dogs and deer regularly amble across the street. Technically, yes, you can shoot the animals, but why would you? They don’t drop any loot. The mission variety is better than it seemed in the beta. 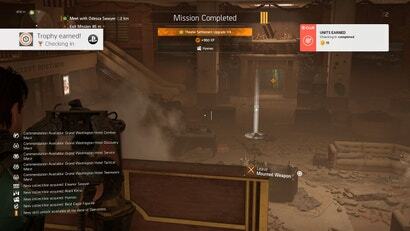 As enjoyable as the game’s recent beta was, its handful of missions was disappointingly generic. Despite being set in different buildings in DC, they followed the same formula: Gunfight your way into a nondescript location, attain some goal (rescue a hostage, defeat an armoured boss enemy and so on), and then gunfight back out. The missions in the full game are still dense with gunfights, but their locations are exciting and occasionally surprising. I was wowed by missions that funnel me through both real and fictional DC museums. The one set in the Air & Space Museum is full of unexpected setpieces that potential players probably don’t want to have spoiled. Another surprise: Side missions sometimes stitch mini-narratives together. In one, I unlocked a character who then wanted to help me out in another newly unlocked side mission, which led to a plot twist that’ll surely lead to another side activity. The game mostly looks great but can be blurry and hard to read. Ubisoft’s Division games are some of the most visually detailed things you can play. You’ll see the best piles of tyres ever put into a game and fountains full of garbage amid canyons of buildings and vast stretches of vegetation. Unfortunately, at least for me and my colleagues playing on PlayStation 4 Pro systems, a lot of the detail in the game world can take a few seconds to show up. When I turn a corner or fast trace into a new part of the map, I’ll see the streets and buildings clearly, but billboards, bus ads and other detailed planes initially appear blurry before snapping into focus. If I’m running, that snap occurs when I’ve nearly passed the blurry signs. This doesn’t impact gameplay speed and is not much of an issue if you’re moving slowly, but it’s a blemish that begs for some better engineering, perhaps through patches. What’s more of a pain is that a lot of the game’s on-screen text for progress and unlockable activities shows up so tiny that players may have to sit close to their TVs or monitors to enjoy this game. You get some weird but excellently destructive gadgets. The first Division had some basic tools such as turrets and healing stations, all of which had some predictable upgrades. Hey, that turret might be a flamethrower instead! The new game is much wilder. I’ve been using a thing called the Firefly: A little drone that I could initially send flying toward a target to blind them. I’ve upgraded it with explosives that detonate if any two of the enemies it tags gets close together. If I sneak up on an enemy patrol, this lets me take three of them out immediately. If I do it mid-gunfight, when enemies are spread out, I’m then trying to corral the enemies so that they trigger the proximity detonations. I just unlocked a shield that deflects bullets, and I’m thinking about getting a gun that shoots a gas cloud that I can light on fire. All of this stuff spices up combat. It has another great in-game Ubisoft map. See? There’s just so much stuff in this game. I’ve done a third of the main missions and a bunch of side missions. I’ve cleared enemy control points and then stocked them with goods to help the civilians who took them over. I’ve wandered the city with civilian patrols. I’ve found little environmental puzzles where I’m challenged to figure out how to access a collectable by spotting a way to unlock a gate or reach a building’s roof. I’ve played a PvP match (we lost, narrowly). I’ve upgraded a settlement and unlocked safehouses. 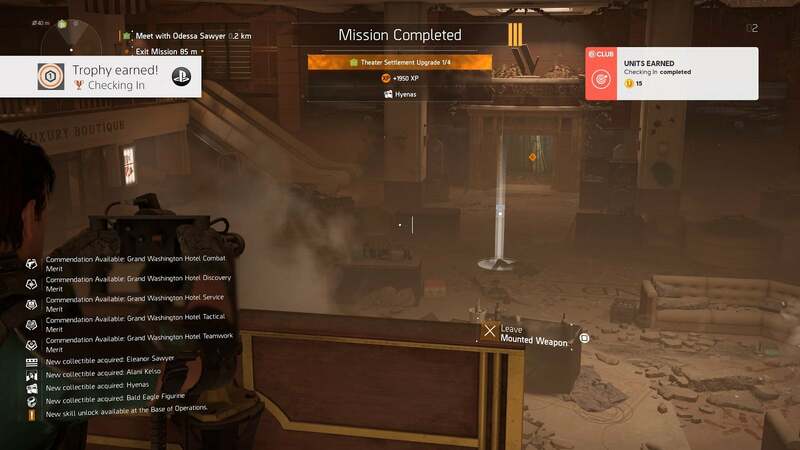 I’ve taken on and completed “Projects”, series-new checklists that offer a range of rewards, and I’ve hunted down a named enemy in a so-called Bounty mission. I’ve unlocked and crafted mods for my guns. I’ve joined a colleague’s in-game clan. I’ve stopped public executions, propaganda transmissions, and other enemy-led activities that crop up in the open world. I’ve found audio logs, watched holograms called echoes that recreate past events, and read dossier entries on enemies and allies. I’ve had a good time doing all of it. All that said, I haven’t even seen three quarters of the game’s map. I’ve only seen the top of the Washington Monument from afar and haven’t made it down the Washington Mall to Lincoln Memorial. I’ve not played through a mission with three other people (my colleagues have done co-op and dug it). Only last night, after 21-plus hours of playing, did I even activate a mission granting me access to the treacherous Dark Zone. I’ve reached level 11, a far cry from 30, the threshold for the much-hyped endgame, in which a new faction invades the map. Once the endgame begins, players are required to choose a character class, and who knows what else happens. 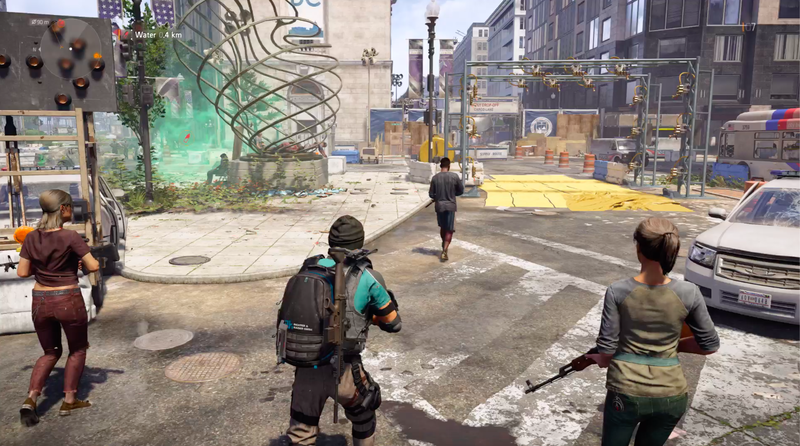 Ubisoft has recommended that reviewers play 15 hours into the endgame to get a feel for what The Division 2 has to offer. I’m not close! The menu design is thoughtful. Aside from the micro-text thing, the game is extremely player-friendly. Its accessibility options include the ability for basic menus to be read out as speech and the option to move and resize major on-screen elements such as the mini-map. The game is stuffed with loot, and coming upon new pieces triggers a handy set of choices, including immediately junking unwanted items. Menus are swift and snappy, and players can track and even turn in quest items right on the game’s map screen. Sometimes you’re forced to go back to hub areas to turn in a quest or advance the overall game, but mid-game loading is pretty fast and hub areas are full of easy access points that let you enter and leave quickly. Generally, the game may be asking you to do a lot, but it wastes little of your time. It is very on-brand as a Tom Clancy game. My character doesn’t smile. 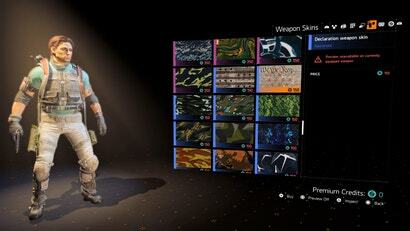 My inventory is stuffed with guns, gun mods and tactical gear galore. The bad guys are very bad (there’s a cutscene of one of them shooting a doctor in the head, for goodness’ sake). We are here to save America. Yes, this is a Clancy adventure, people. The buzz on The Division 2 so far is that it isn’t stumbling out of the gate like its predecessor nor its newest competitor, Anthem. Games such as these, however, take some time to reveal their true level of quality. The first Division got way better with patches deep into its first and second years. It’s encouraging that the sequel feels like iterative progress, but it has set a higher bar and, with that, risks a bigger fall. We’ll see. This game is starting off superbly. I myself was pleasantly surprised with the beta, actually. Found the missions in it far more interesting than those in the first game. One of the biggest issues that I had with the first game was that you felt completely disconnected from society, despite the implications the trailers had. The beta almost immediately relaxed that for me. Yeah that's the part I'm enjoying the most, getting to see the communities develop and roam the streets more. It's pretty cool to see in game. Honestly I hated the beta, while i loved the first game, I felt no calling to this. thankfully a family remember bought for me and so far loving it. There should be an accessibility option to turn off menu transitions, I agree. You know, considering they went through the effort of menu narration. Havent installed Div 2 yet to see if it changed (copy sat on my work desk over the weekend), but I couldn't find a way to turn it off in the open beta. I hadn't really noticed it until @blakeavon commented on it though, so its definitely a person to person issue. Given the effect on him though, it seems pretty clear the option to turn it off would be appreciated. Ubisoft are pretty solid with accessibility issues like this though, so hopefully some feedback will see it improved. Yeah there are a bunch of great accessibility options when you launch the game for the first time, so it seems they are pretty committed to it. Can anyone confirm that the DLCs are free? If so kudos to Ubisoft. AFAIK the premium pass is just for earlier access. I bought the first one about the time it got its patch which made it better (1.5?) and loved it. My system was starting to get old but handled the game well in 1080. But had a look at the specs for Div 2 and my ageing system (i3-4170 and GTX 750Ti) have finally dipped below the minimum specs required. Time to start saving for a new PC. I thought there was an option to increase font size. Did't get into the first game. Empty 2 clips of ammo and the npc still walks around. This one is much better. There sure is snd large text feels very readable.